MainAll NewsInside IsraelChief Rabbi: Could we study without soldiers? Chief Rabbi: Could we study without soldiers? Sephardic Chief Rabbi Yosef on Independence Day calls to be grateful to secular founders of Israel, urges spiritual independence too. 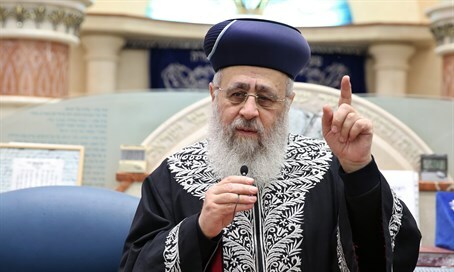 Sephardic Chief Rabbi Yitzhak Yosef gave a festive speech in honor of Israeli Independence Day on Thursday at the Great Synagogue in Jerusalem. "The incredible ingathering of the exiles, they came from all ends of the earth, everyone came to the land of Israel," said Rabbi Yosef. "The prophet Yehezkel (Ezekiel) already foresaw it back then." "The prophet prophesied the redemption which thank God is approaching the ingathering of the exiles. It is not in our merit that the Holy One blessed be He did this, not because we are worthy of it, not in our merit. We did not observe his laws, even though we came to the land of Israel." He emphasized that "if such a great ingathering of the exiles was done like this, it is despite that we desecrated the name of the Holy One blessed be He among the non-Jews - think what would have been if we had truly walked in his ways, what the nation of Israel would have merited." "Today thank God most of the nation of Israel is here in the land of Israel. There is a possibility here to sit and keep the commandments, there is no one who will tell you what to do, there is a democracy in which one can study Torah and educate their children." Given the freedoms of being back in Israel, he stated, "therefore precisely on this day (Independence Day) we have to know: physical independence without spiritual independence is worthless. We need physical independence together with spiritual independence. The spiritual freedom is the core." "We have to be grateful that we are here in the land of Israel and can sit and observe the commandments, each person as they desire. If there weren't soldiers and the entire establishment of the state, could we sit in quiet and study Torah? Could we educate our children?" Recognizing the largely secular founders of the modern state of Israel, he pointed out "what was here 80 years ago. They (the pioneers of the modern state) were the emissaries of the Holy One blessed be He, in their merit we sit to study Torah. We have to be grateful to the Holy One blessed be He." "Since the destruction of the Second Temple there wasn't such a large Jewish presence in the land of Israel. Thanks to God the state is developing every day. All this is from His kindness, may He be blessed. We have to be grateful."